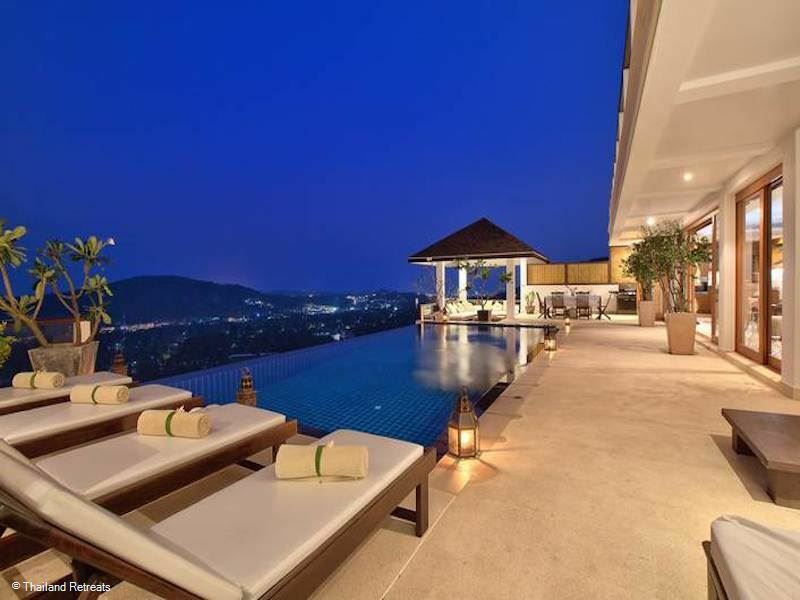 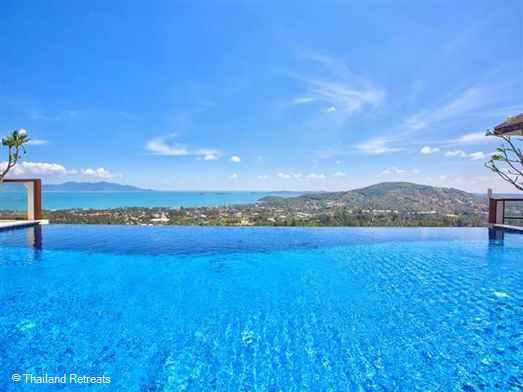 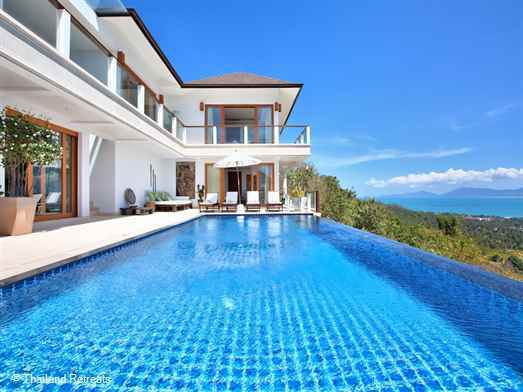 A magnificent villa set in the Bophut hillside, a relaxing retreat with infinity edge pool that has breathtaking views of the ocean. 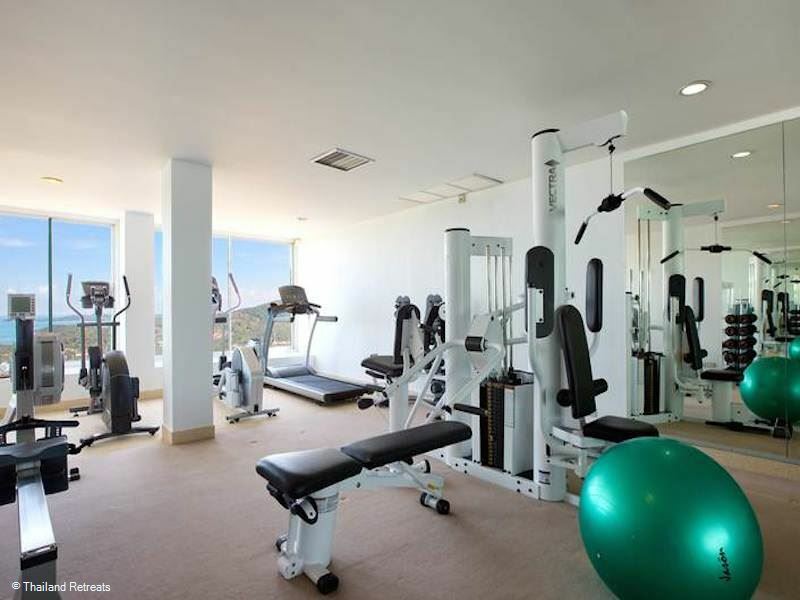 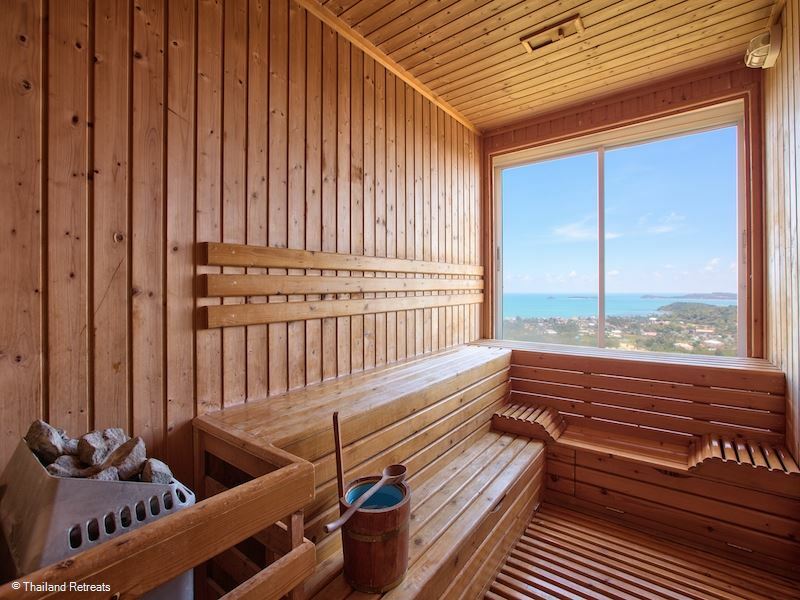 Steam, sauna and fitness room. 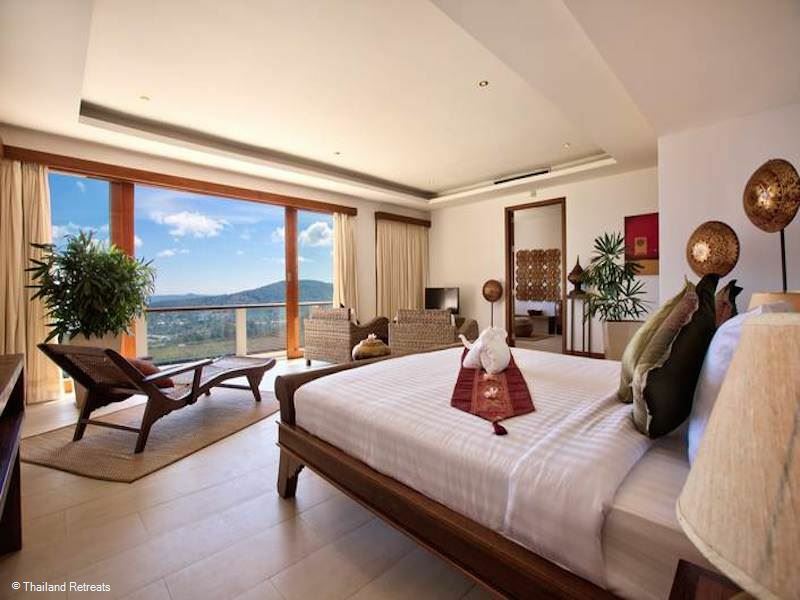 Ban Lealay has been designed to accentuate the natural beauty in which it lies and ensure that all of its guests absorb the calm it exudes. 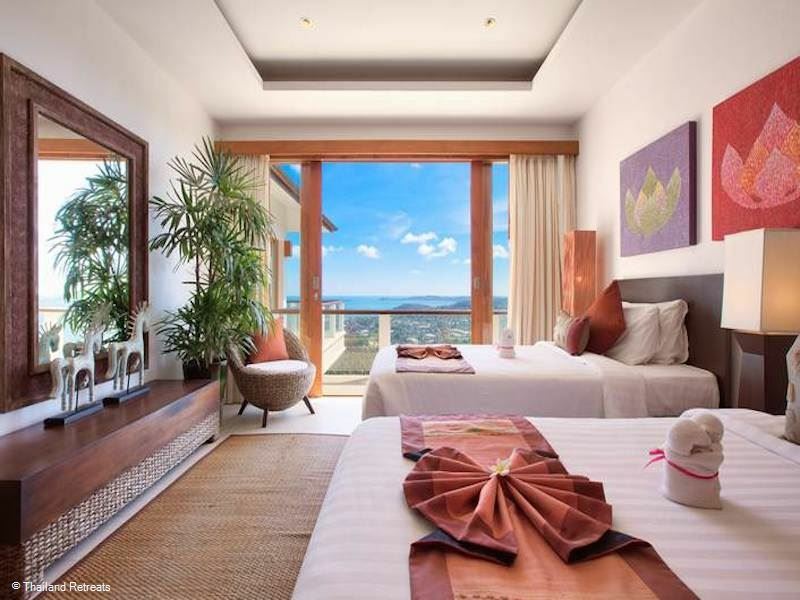 Sitting high in the hills, overlooking the north-eastern coast of the island, the villa has been designed to showcase the amazing views that it overlooks, with virtually every room of the property having picture windows. 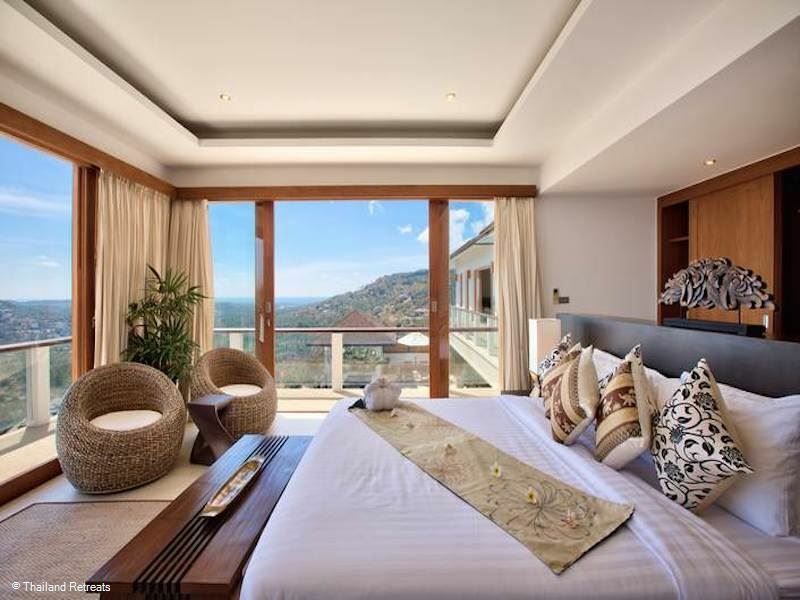 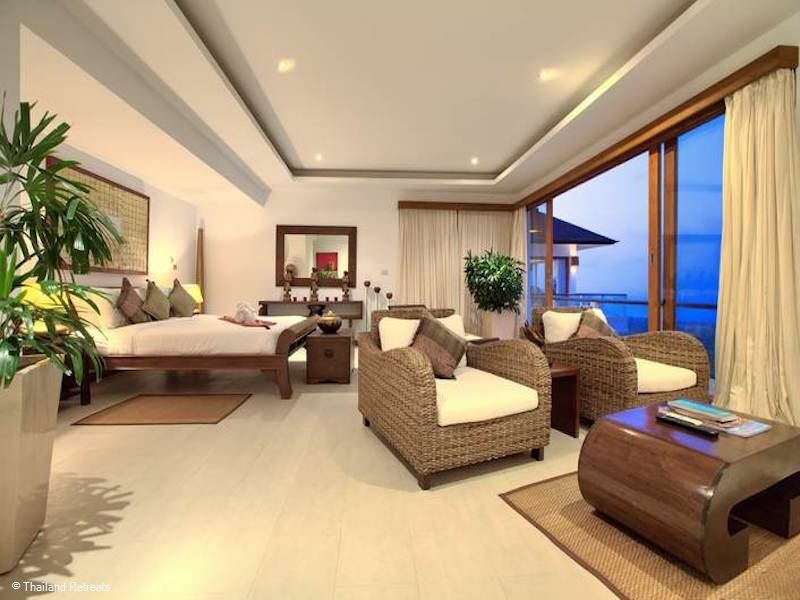 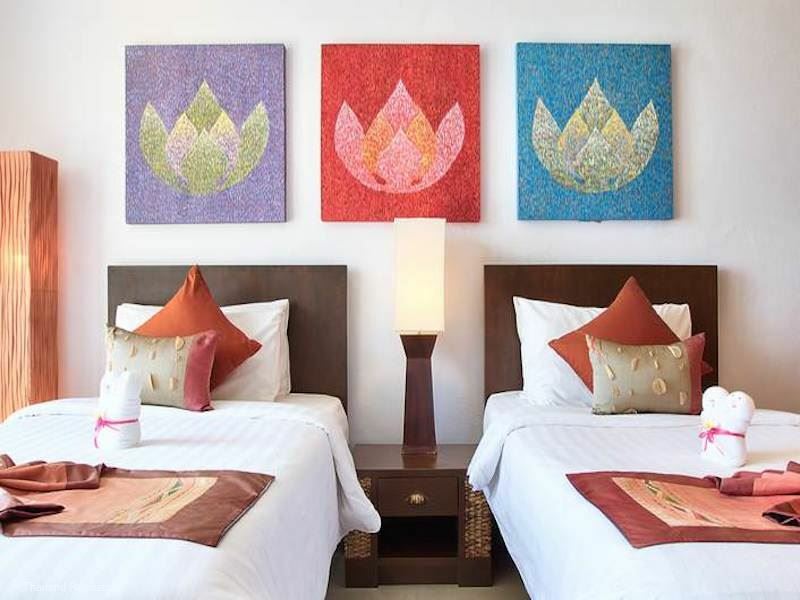 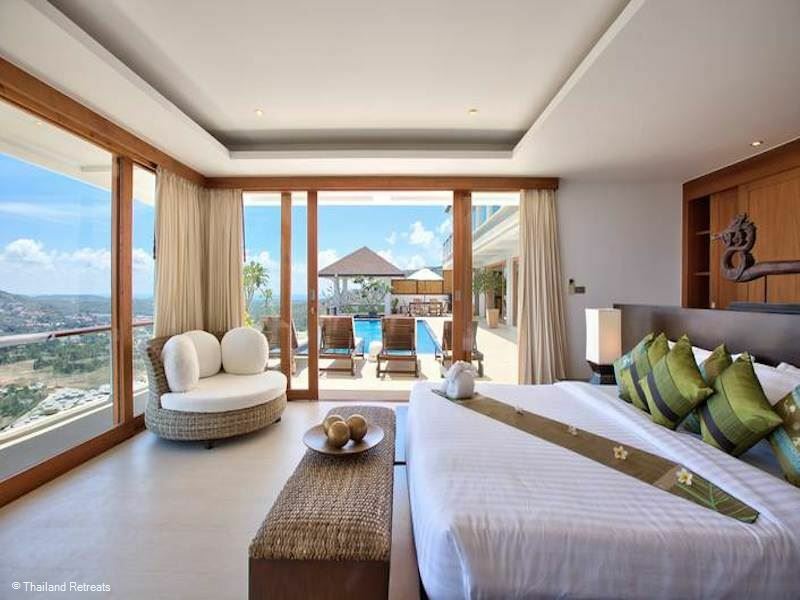 The environment surrounding the villa is stunningly beautiful and the interior design complements this with a modern Thai style flowing seamlessly through each room. 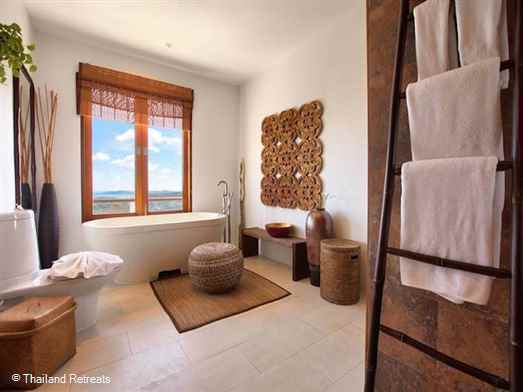 The style and comfort is identified as soon as you enter the main gates of the villa and past the calming water feature to your left. On entering the front door, you are faced with panoramic views directly ahead with stairs that lead down to the main living area. 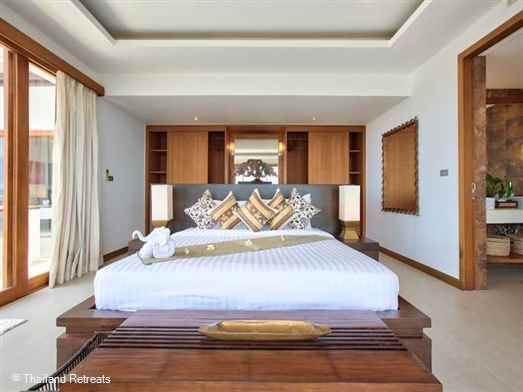 Three bedrooms are located on this upper level and consist of one double (king bed), one twin (two single beds) and the very expansive master bedroom (king bed). All bedrooms have their own individual design and decoration concept; satellite TV/DVD; and a large en-suite bathroom with walk-in shower and terrazzo bathtubs complete with their own view. 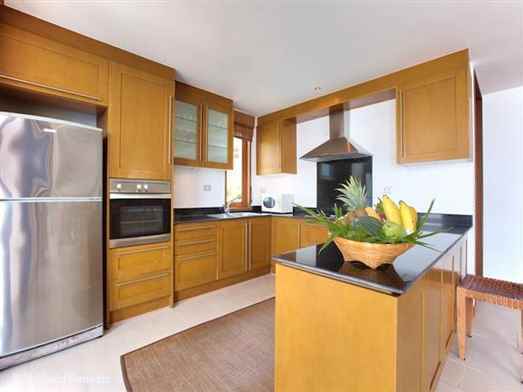 Heading down the central staircase, you arrive in the large living/dining and kitchen area. This lovely area encapsulates the essence of indoor/outdoor living with its floor-to-ceiling doors that open onto the generous sun terrace and pool; the glorious views always remaining in full sight. 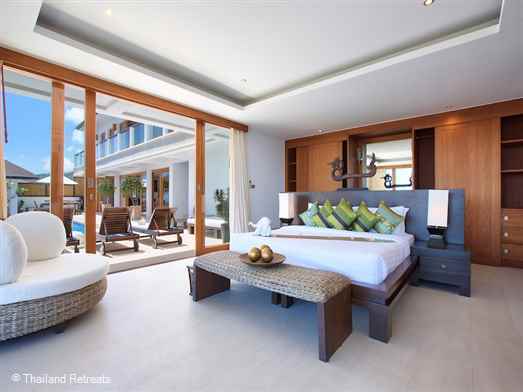 To the left of the terrace is the fourth bedroom (king bed) which has doors opening directly onto the pool deck. 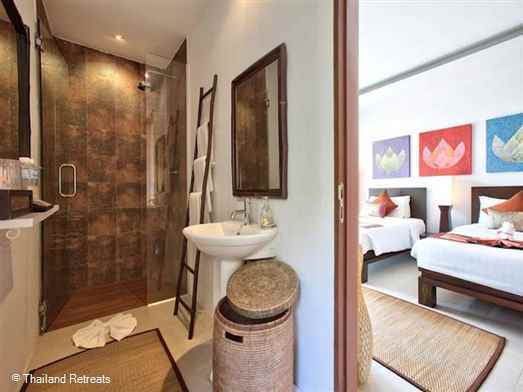 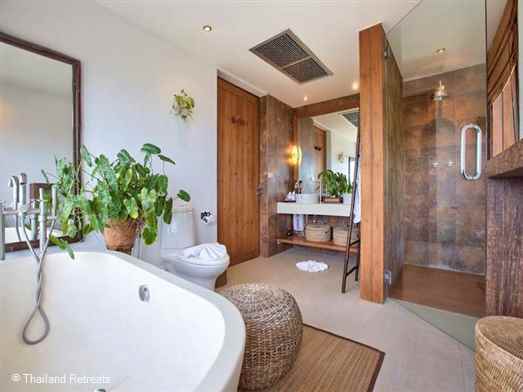 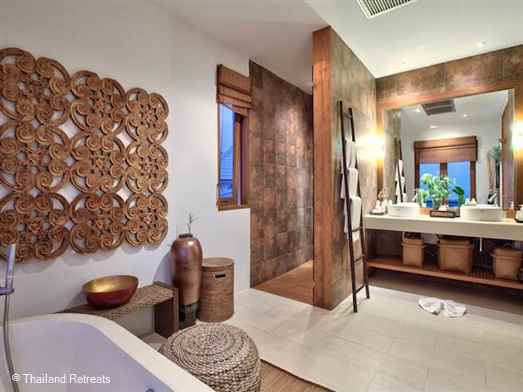 The en-suite bathroom affords the panorama that Samui is renowned for. 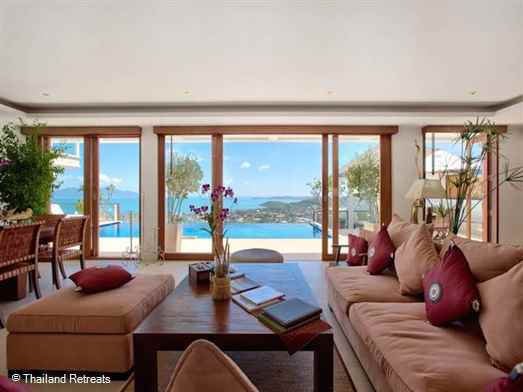 To the right of the main living area there's a Sala equipped for lounging and dining which is positioned at the edge of the terrace to ensure unobstructed views can be enjoyed whilst dining. Ban Lealay is a beautiful property that captures what's desired to ensure a relaxing experience. 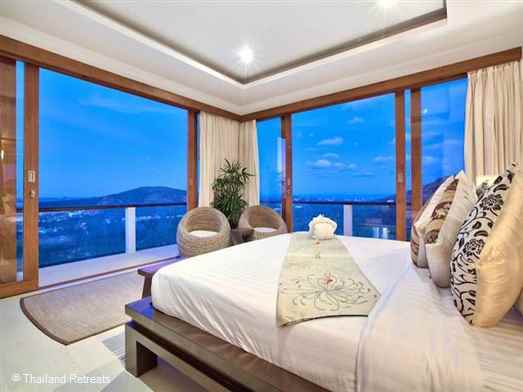 With modern styling and design working with touches of Thai authenticity, the privacy of the surroundings and stunning vistas that can be enjoyed day or night, this villa is sure to please all that are looking for an island getaway which implores you to enjoy the unique and extraordinary. 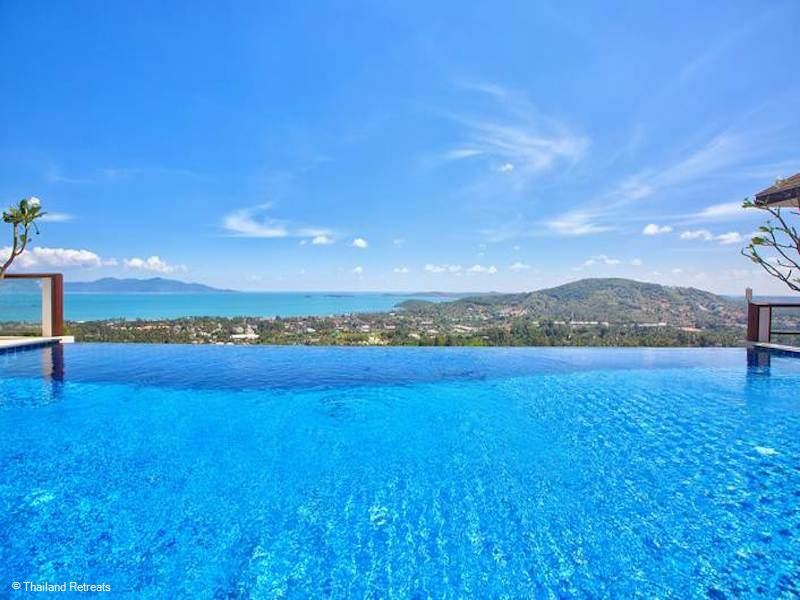 Bophut is located in the north of Koh Samui between Big Buddha and Maenam and it is considered a popular place to stay or visit as it is a good compromise between the hustle and bustle of the larger towns on the east coast and the more tranquil setting of the south and west coasts.